Sweet Perfumella Spray Roses are beautiful smaller scale garden roses (they are often called miniature roses or sweetheart roses). The Sweet Perfumella spray rose variety boasts up to 5 blooms per stem with deep, full and swirly light pink petals. On spray garden roses, it is very typical for only one or two blooms per stem to open, leaving the others in bud form and giving the flower its wild, rambling feel. Sweet Perfumella has a delicate, light fragrance. It is ideal for gift or mixed bouquets, arrangements for the home, for weddings or for boutonnieres and corsages. Choose Sweet Perfumella for its creamy peachy to light pink blooms and for its romantic garden charm. Length: Our Garden Roses range from 12-24 inches long. Spray Garden Roses come with 3-5 blooms per stem. 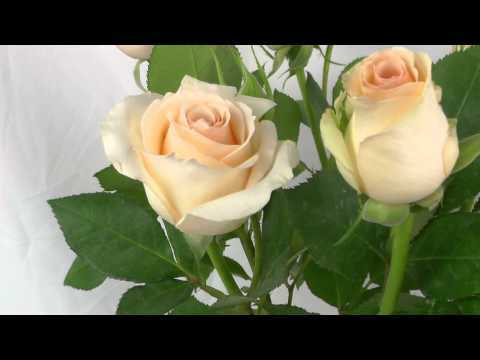 Spray Garden Roses include 10 stems per bunch. Diameter: Spray garden roses have an average diameter of 1.2 to 1.6 inches when closed and approx 2 to 2.8 inches diameter when opened. Please take note that Garden Roses in general have a short vase life of up to 1 week. Also, please contact us directly for any last minute requests on garden roses.